VIZ Media offers an exciting new home media release with the debut of the RANMA ½ OVA & Movie Collection on September 19th. Return to the world of RANMA ½ with this unique collection based on the smash-hit manga series created by Rumiko Takahashi. The RANMA ½ OVA & Movie Collection will be released in DVD and Blu-ray editions and will include eleven episode-length Original Video Animation (OVA) adventures as well as three RANMA ½ theatrical movies. 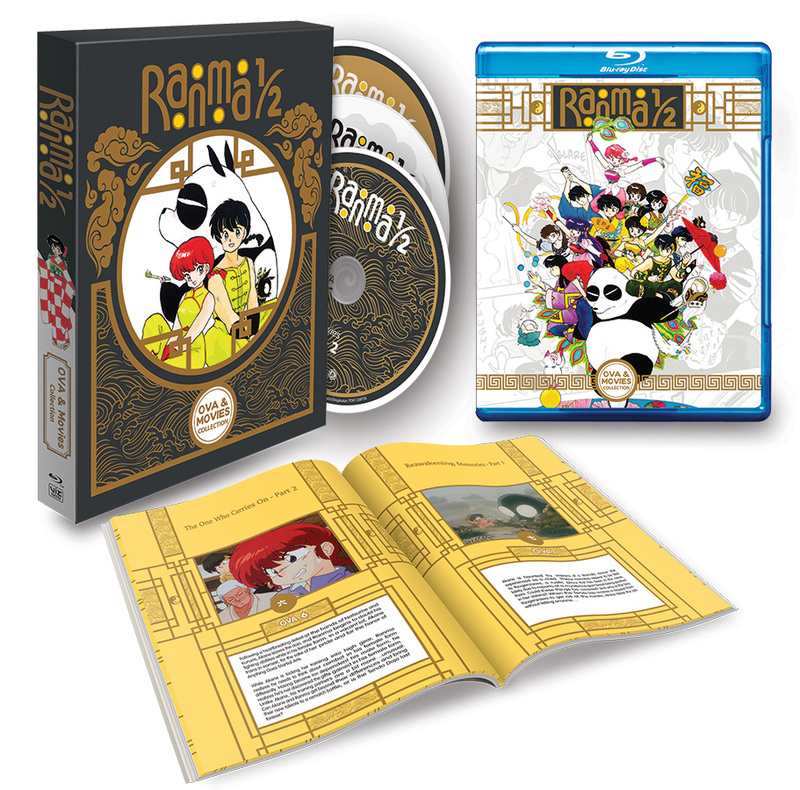 The RANMA ½ OVA & Movie Collection Blu-ray Edition will carry an MSRP of $54.97 U.S. / $63.99 CAN, and comes packaged in a premium full-color chipboard slipcase. The three-disc set features full 1080p High Definition resolution with 16:9 video aspect ratio. Subtitled and English dubbed dialogue options are available. Bonus content includes a 24-page full-color booklet, upcoming OVA previews, and clean opening and ending segments. The RANMA ½ OVA & Movie Collection DVD Edition will carry an MSRP of $39.99 U.S. / $52.99 CAN. The three-disc home media set presents content with 16:9 video aspect ratio and also features subtitled and English dubbed dialogue options. Notable bonus features include clean opening and ending segments. Ranma Saotome, the iconic character created by master artist Rumiko Takahashi, is back for new adventures and more than a few hilarious misunderstandings along the way! From mishaps at a holiday party to casual use of mystical trinkets to possession by cursed dolls, what’s in store for Ranma is anyone’s guess in these original anime adventures. Also included in the new home media set are two feature-length RANMA ½ movies and one special OVA-length movie that brought Ranma to theaters to make some big choices with his heart and not his head…which is usually what starts his trouble in the first place! RANMA ½ manga creator Rumiko Takahashi is one of Japan’s most prolific and respected manga artists and is the creator of several long running series including MAISON IKKOKU, RANMA ½, and INUYASHA, which are all published in North America by VIZ Media. The spotlight on her prolific career began in 1978 when she won an honorable mention in Shogakukan's annual New Comic Artist Contest for Those Selfish Aliens. Later that same year, her boy-meets-alien comedy series, Urusei Yatsura, was serialized in Weekly ShonenSunday. This phenomenally successful manga series was adapted into anime format and also spawned a TV series and half a dozen theatrical-release movies, all incredibly popular. Takahashi followed up the success of her debut series with one blockbuster hit after another— MAISON IKKOKU ran from 1980 to 1987, RANMA ½ from 1987 to 1996, and INUYASHA from 1996 to 2008. Other notable works include MERMAID SAGA, RUMIC THEATER, ONE-POUND GOSPEL, and RIN-NE (all also published in North America by VIZ Media). For more information on RANMA ½ or other award-winning anime titles from VIZ Media, please visit VIZ.com.